Carryout a total pirate getup with eye patches and this pirate hat. Crown the ship's crew with this easy-to-craft seaman's hat. 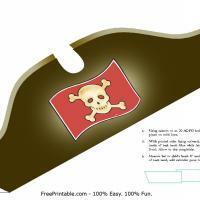 Complete the pirate party kit with invitation, centerpiece, treasure chest etc.